As a parent it seems that life revolves around ideas that go well, ideas that just go, and ideas that completely flop. Every once in a while I have an idea and it is PERFECT. The stars align and I bask in the glory of a job well done as I watch one of my children bring the idea to life. Today, I want to share my one brilliant idea with you. I am a creative person, but it isn't very often that I come up with a project that is one hundred percent my own that also goes really well. Usually I pull from here, there, and everywhere else to reach the goal. This one is mine from start to finish, and I just love it. We call it the "Birthday Card Calendar". My four year old has always loved the ABC's. She began her love affair with an ABC Melissa and Doug puzzle. Before I knew it she started trying to write some of the letters with me on a chalkboard. Not long after her third birthday over a year ago my idea started to form. I will say that this probably went really well because writing letters was of major interest to her. If you have a child who doesn't seem interested in learning about or writing letters don't feel discouraged. You could do this project on a smaller scale, see if it broadens their interest, and then start it full on at the beginning of the year. I'm sharing this in September because it takes some time on the front end. 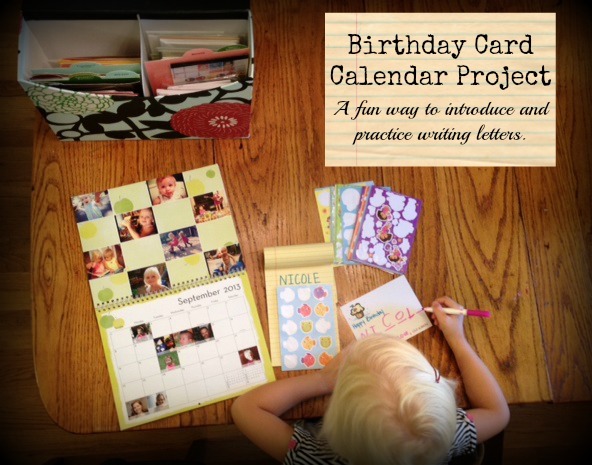 The idea for this project is that each month your child will create a birthday card for each person you have on your calendar in that month. They will write each name on a card with your guidance, and then they will decorate it. They are practicing writing letters over the course of a year while also sending something lovely to their friends and family. * Go to your favorite photo website that lets you create and buy calendars. I used Shutterfly. After looking at the calendar options on various sites I felt Shutterfly would work best for this project. * Create a calendar to your liking for the coming year. Add in all of the birthdays. On Shutterfly you can also put a picture of the person in the square on their birthdate. When I first started doing this I felt like a crazy person. It took a lot of time and seemed so silly. However, the pictures are by far the best part. Lila LOVES to look at each month and actually see who she is sending a card to. I also pulled pictures from Facebook for this to save time. * Order your calendar. When it arrives sit down with your child and talk about the project. Go through the calendar and talk about how this project will work. I ordered mine from this great Etsy shop called Meyer Market Designs. I told the shop owner, Bernadette, about my project idea and what I wanted. I counted up how many birthdays were on my calendar and ordered ten more than that number. You could easily go to the store and buy any sort of cards you want. 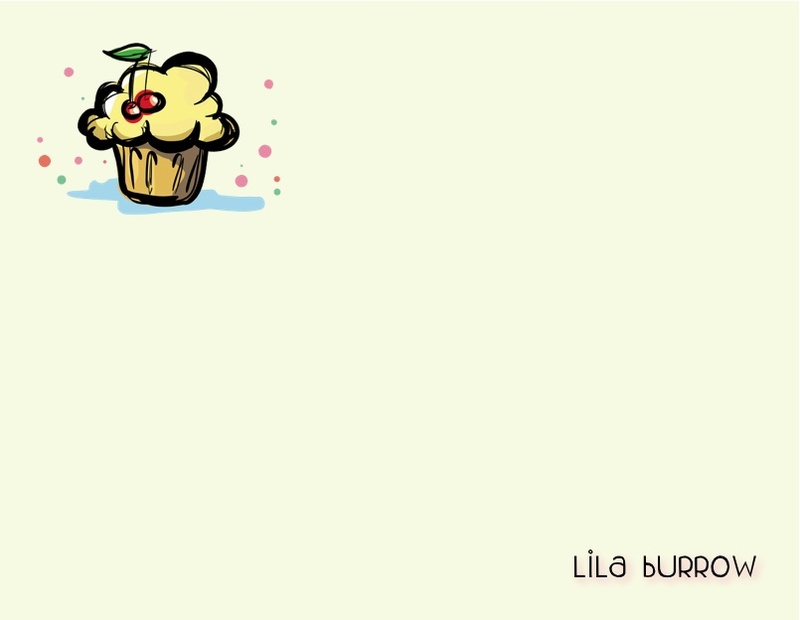 I just wanted plenty of space for Lila to write in the name. I ended up writing "Happy Birthday" under the cupcake on each card. Next time I would add that to the printing! While there may be more mistakes, markers make this seem more grown up and fun. On the notepad I write the names in a list for Lila to reference as she writes each card. We are only doing all capital letters right now, but if we do this again next year I will incorporate lower case. Stickers, crayons, markers, etc. She does the name on the front and decorates the back. * We try to do all of the birthdays for the given month in one day. Or, if there are too many she will do the names one day and decorate them the next. * I also included a note from me explaining that Lila was practicing writing her letters by sending friends and family birthday cards. This way I could send a greeting and birthday well wishes at the same time. That's it! There are so many great things about this project. It's something I do with Lila while Evie is napping which makes it great one on one time. If I notice she is struggling with a certain letter we practice that letter more at another time on a chalk board. Whenever possible we hand deliver her card. She feels so proud when handing her card to someone. Lastly, I can see dramatic changes from the beginning of the year to now. I so wish I had taken pictures of the cards each month before mailing them to see the improvement and to show her the differences. I know this is a lot of information and sounds like quite an undertaking. It is! But, it has been the very best thing I have ever done with her. Plus, once you create a calendar like this in Shutterfly they will automatically transfer the pictures and dates to the next year. You could do this each year with a lot of the work already completed from the year before. If you have questions don't hesitate to contact me. I hope someone else gets as much enjoyment out of this project as we have! There is now a Pinterest button on the top right corner of my pictures in case you want to Pin more easily. Fun! Cole is really into letters too and turns 3 in November. Might be a great way to start the new year. I can't tell you how many family members have been blown away when they received Lila's birthday card, Jana. This is just the coolest thing ever! I still have my card on the refrigerator and will cherish it forever! What a special thing for you and Lila to do for the rest of us! Thank you!! Lila's card was one of my faves! Made my day :) Keep up the good work raising such a Lovely Lady!